The name “fulvous” refers to the rich rusty colour of these birds. Their long grey legs and beaks almost appear blue by comparison to the plumage, especially in young birds. Wild fulvous commonly feed at night on waste grain (especially rice), seeds, and structural plant material found in fields and shallow water. 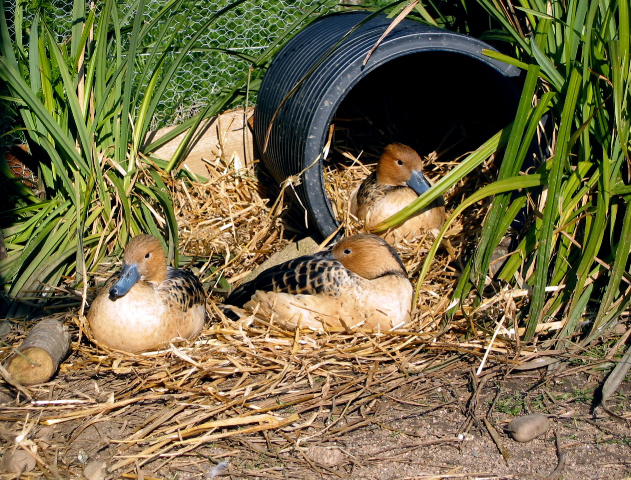 In captivity they are active off and on all the time, but in common with the other whistling ducks they are very vocal in the evenings. They fit well into a community and will breed over a long season, particularly if they can lay eggs in someone else’s nest. 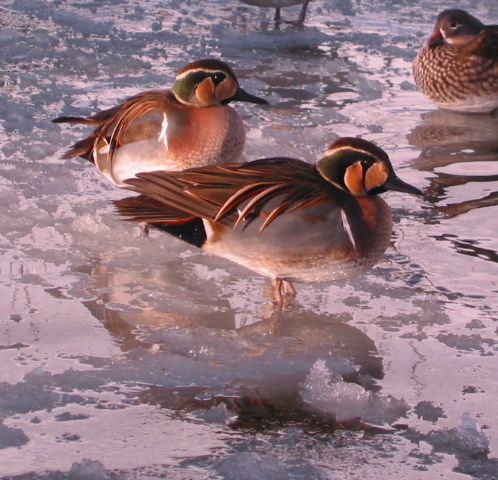 Prolonged frost and snow can be a problem with the whistling ducks. We solve this by providing shelters and dry straw. 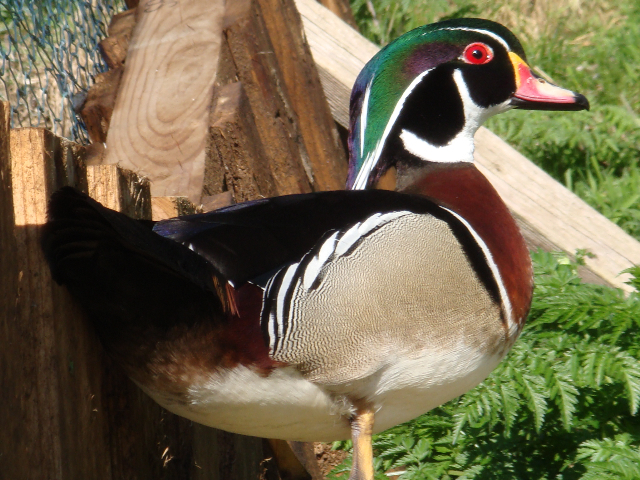 There are two ranges of wood ducks in the United States. One runs from Southern British Columbia down the western coast of Washington and Oregon to Southern California. The second extends from Southeastern Canada to the Gulf Coast and Florida. 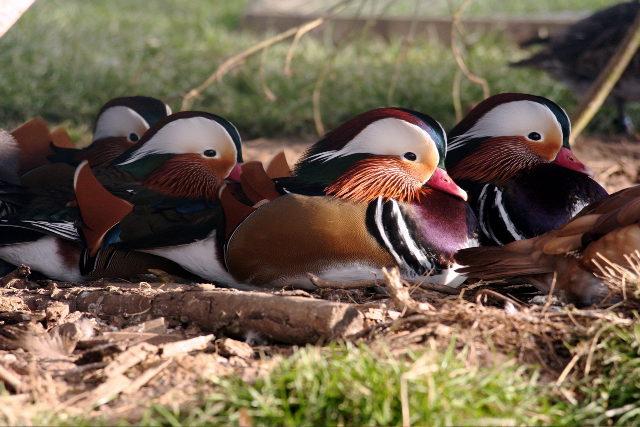 They fill the same ecological niche as the mandarin in Asia; forested freshwater wetland. Although mandarin and wood duck will pair with one another, there are no documented records of hybrids, so they are safe to keep together. Carolinas are the earlier to breed, but only by 2 or 3 weeks. It can be tricky to get the ducklings to feed. Probably the most well known and striking of the wildfowl they are, unsurprisingly, featured frequently in oriental art. This species was once widespread in eastern Asia, but it is now endangered because of large-scale exports and the destruction of its forest habitat. The populations in eastern Russia and in China are both probably well below 1,000 pairs, although Japan may have around 5,000 pairs. A South American duck with strong, pointed claws. With no hind toe for grasping branches, they nevertheless have a fairly firm grip. 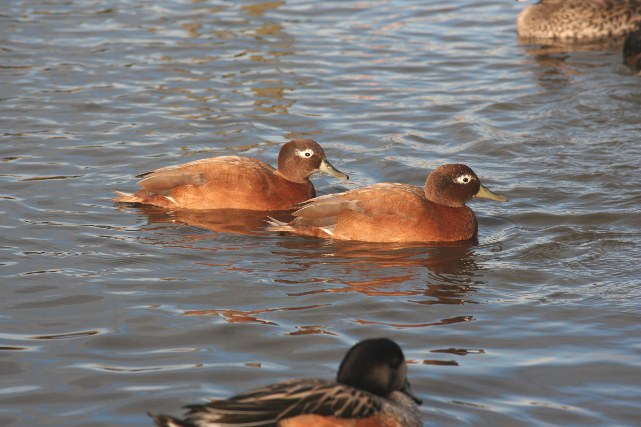 At first glance they may appear to be sma’ broon ducks but the males have striking pinky orange feet and bills. Both sexes have amazing metallic blue/green portions to their wings. Our birds rarely bother with trees and branches. They seem content with causing mahem. They do no real harm but appear to enjoy causing a ruckus. Definitely up there for entertainment value. I need add only that these charming birds will graze your grass down to a fine baize. 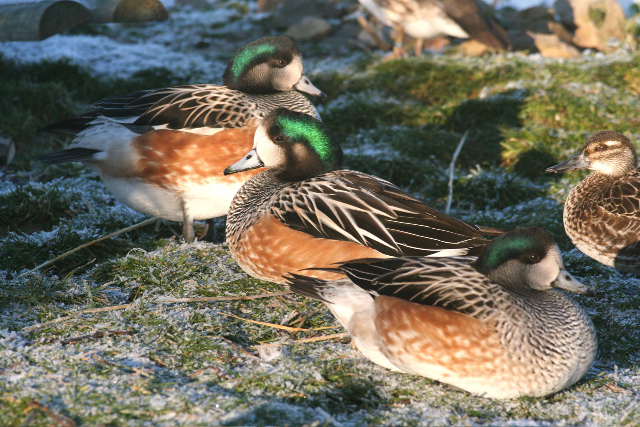 The Chiloë Wigeon is widespread around the Falkland Islands, although not particularly common. It generally inhabits large ponds, rivers, tidal creeks and kelp beds where it feeds on aquatic invertebrates and vegetation. Sexes are similar in appearance. They are easily identifiedl by their distinctive black, white and tan plumage. The sound of a raft of Chiloë, chattering and bobbing is one of the most delightful in a collection. 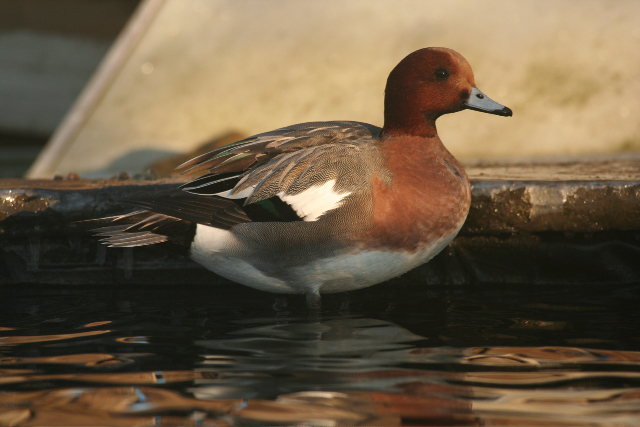 All wigeon have a short stubby bill adapted for grazing. A dabbling duck which breeds within the forest zone of eastern Siberia from the Yenisey Basin eastwards to Kamchatka. The breeding male is unmistakable, with a striking green, yellow and black head-pattern and a white vertical line at the side of the breast. The females also have a distinctive head pattern with a small but prominent circular white loral spot, and a dark stripe behind the eye. 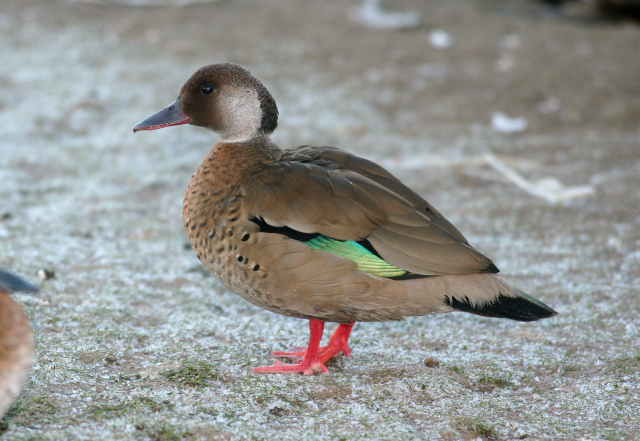 The juvenile has a similar plumage to that of the female, and can be distinguished from Common Teal by the pale loral spot. In non-breeding (eclipse) plumage, the drake looks more like the female, but plumage is a much richer rufous colour. Good community birds without vices. Courtship displays are entertaining and both sexes become confiding. This species is classified as Vulnerable due to hunting and destruction of its wintering wetland habitats. 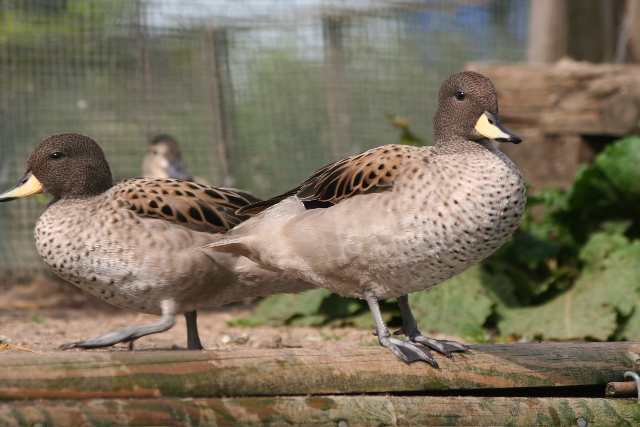 Cape teal are one of the few species of dabbling ducks that dive, and are surprisingly capable of swimming underwater with closed wings like true diving ducks. Other dabbling ducks dive in this way but they usually open their wings while under water. They are known to perform what is referred to as 'nod swimming' during courtship. It is a rapid scoot over the water surface in a semi-circle with the wings positioned so that the speculum is showing. We find these birds do do well in a community, but some breeders find them on the aggressive side. 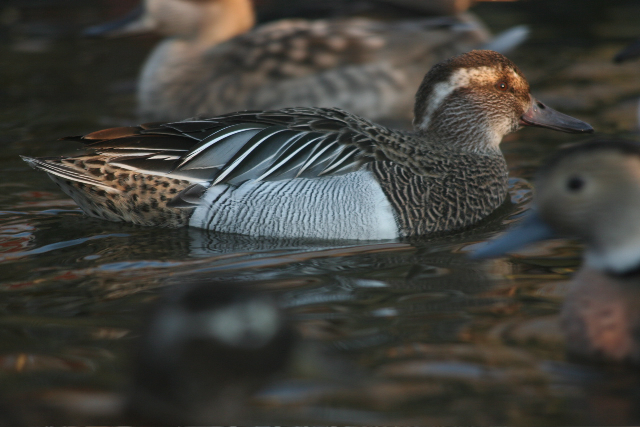 Males will pursue other teal and we have had Cape teal x Brazilian teal crosses so have had to separate the groups. 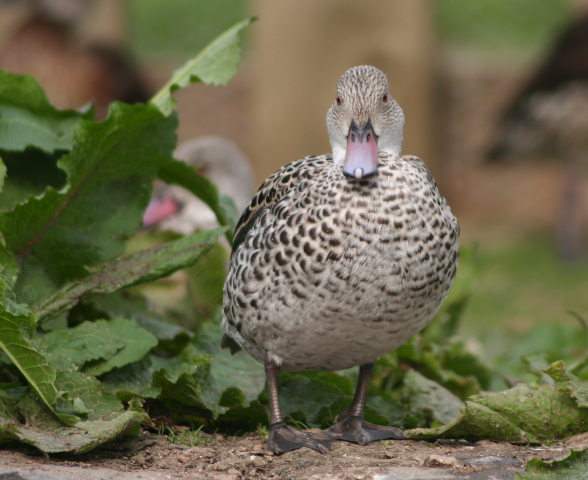 Cape Teal are good parents and will vigorously defend their young even against larger birds. This species is from the high regions of the Andes where it inhabits lakes, marshes, streams and rivers. Pairs dabble and up-end in shallow water or stand in wet boggy areas with occasional diving. Though busy enough during the day, they are most active at night. Handsome little ducks with light brown plumage and yellow bills. Ideal community birds with no vices that we have observed. 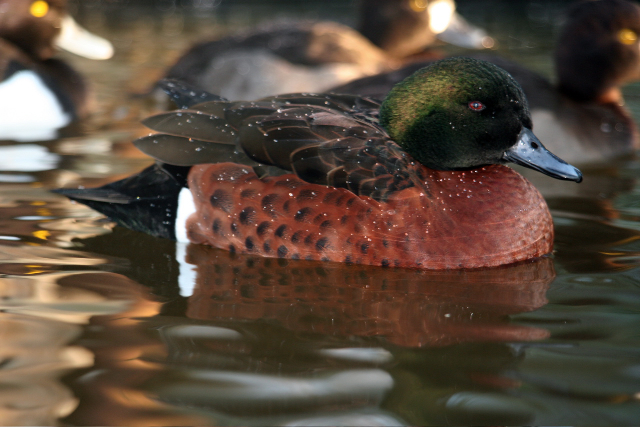 This species inhabits coastal areas of southern and south-eastern Australia and is the most abundant duck on Tasmania. They frequent both fresh and salt-water habitats. Chestnut-breasted teal are another species that can be aggressive but we have not found our birds to be so. 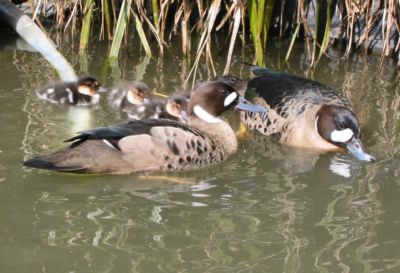 They are in a community pen with pintail, Hottentot, tufted, shovellers and bufflehead without drama. They seem to prefer elevated nest boxes. One of my personal favourites, Laysan teal are amongst the most tame of the wildfowl. They are always underfoot and interested in what you are doing. Deservedly popular in collections, we have the wild coloured brown birds and also the ginger types. Endemic to Laysan Island, which lies some 225 km off the Hawaiian Islands. The species neared extinction due to the introduction of rabbits in 1902. Similar in size and colour to our own wild mallard female, except for a striking bright yellow bill. Both sexes similar. Widespread in Africa from southern Uganda and Kenya down to the Cape on freshwater lakes, ponds, estuaries and marshes. 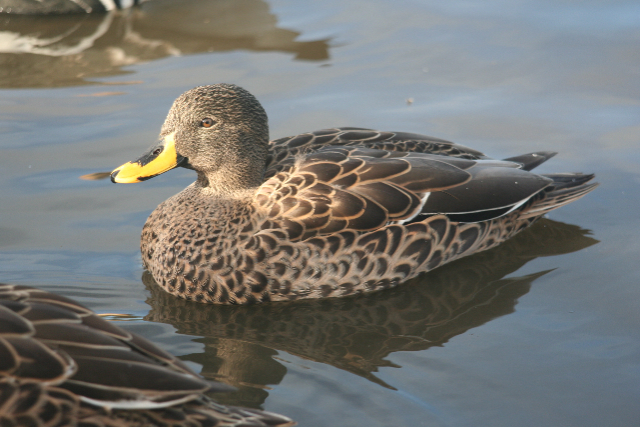 The African yellow-billed duck is found up to altitudes of 3000 metres and only breeds at altitudes above 1500m there. Similar in habit and display to the Mallard, these ducks have engaging personalities. They are fine in community pens but should be separated from domestics in the breeding season as they will inter-breed with mallard. For this reason, breeding pairs should be kept in covered aviaries. This is a large and handsome bird with a large white facial patch and striking purple/bronze speculum. Special facilities are needed to keep this species as they are aggressive. Outside the breeding season, which is early for us here in the north, they may tolerate other pen-mates but we do not like to take the risk. They prefer no to be disturbed when nesting. Not a beginner’s bird but well worth the effort if you have the facilities. A common and widespread duck which breeds in the northern areas of Europe and Asia and across most of Canada, Alaska and the midwestern United States. The male is striking in his white, grey and charcoal plumage with a distinctive pointed tail. The females are light brown with a whiter throat, and their pointed tail is shorter. In eclipse plumage, the drake looks more like the female. 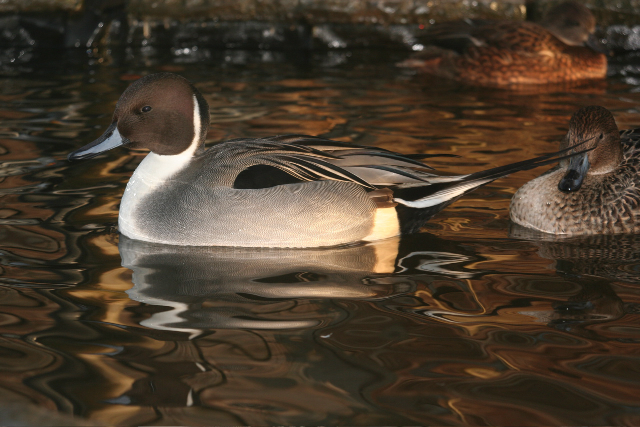 Pintail are good hardy birds with few vices, happy in community pens. Small and perhaps a little shy, our native garganey is handsome nevertheless. The breeding plumage is about the latest to appear. Happy in communities with other birds of similar size, we find that whistling ducks in particular don’t seem to like them. Once a nest site is chosen, pretend not to notice, if the duck thinks you have found the nest she will desert and lay somewhere else. If you are lucky.